Some foliage plants look more attractive when displayed as single specimens, but many not only look best, but grow better in groups. 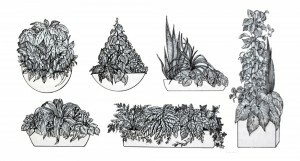 A thriving plant community can better be created by grouping a number of small pots on a window sill, in troughs or with larger plants at the floor level. Some of most pleasing displays consist of growing the plants together in their container. Shape of the group of plants: One popular way to build up a group of plants is to base it on shape. A display can be round or triangular, vertically or horizontally rectangular, etc. 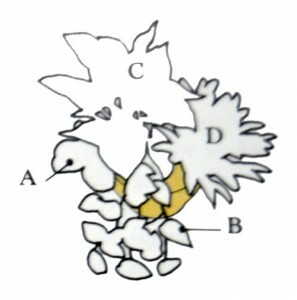 Whatever the shape, it can be further emphasized by a suitable shaped container. 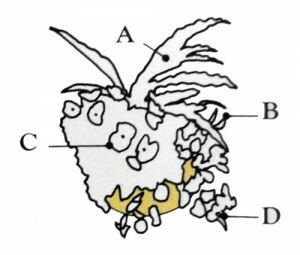 In choosing the plants, though, be sure all of them relate to the planner shape and need similar conditions. The possibilities for attractive arrangements of compatible plants are endless. 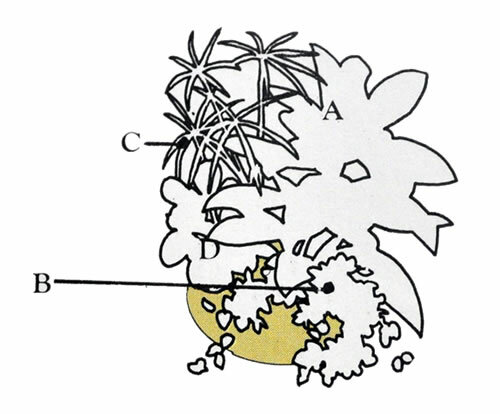 The only rule is that the grouped plants must be compatible – their needs must be similar. 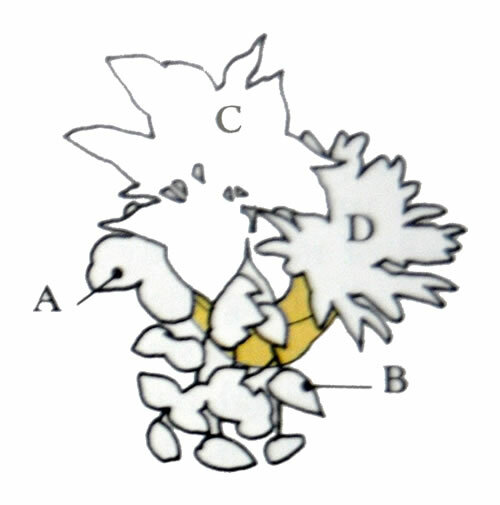 A satisfactory group can be composed of closely related plants, such as: Different kinds of cactus or bromeliad. Contrasting foliage colours: Try using plain green leaves to accentuate the richness of coloured leaves, or conversely, put a green plant in the midst of brightly variegated foliage to provide a calming contrast. 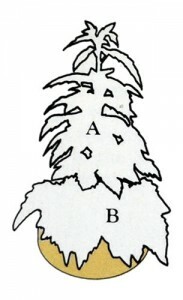 Or a particular arrangement can emphasis the different shade of green in an all green group. Different plant size: Similarly, a tall plant included in an otherwise low group offers a dramatic contrast. And a trailer cascading over the rim of the container will soften a severe design. 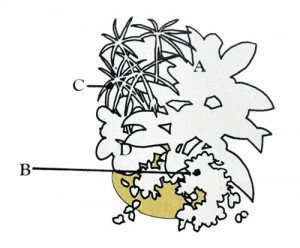 Groupings based on foliage different texture: Hairy and corrugated leaves are often effective in conjunction with smooth and glossy ones. 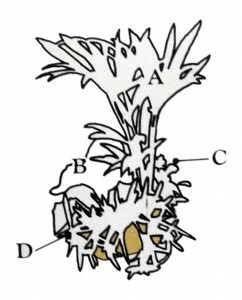 Adding flowers to plant groups: A flowering plant, especially one that keeps its blossoms for long periods, will add a welcome extra dimension to a group of foliage plants. Flowers can be used either to complement or to contrast with leaf colours. In particular, a few floral shapes and colours are very useful for transforming small foliage arrangement into table centerpieces in place of cutting flowers. 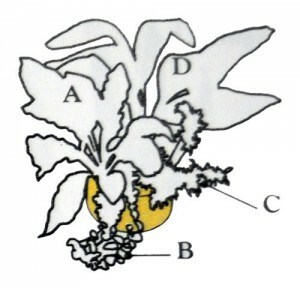 Temporary flowering plants as Chrysanthemum and Primula can serve the same purpose. Contrasting plants shapes: The different shapes of indoor plants are most successfully accentuated when one shape is placed in striking juxta-position with an obvious opposite. Upright shapes associated with low rosettes, climbers and trailers. It is generally wise, though, to avoid too many contrasts in a single display. Decide on a theme and build up a group based on colour or shape or texture. And do not choose over-fancy containers whose design can detract from the natural beauty of the plants. 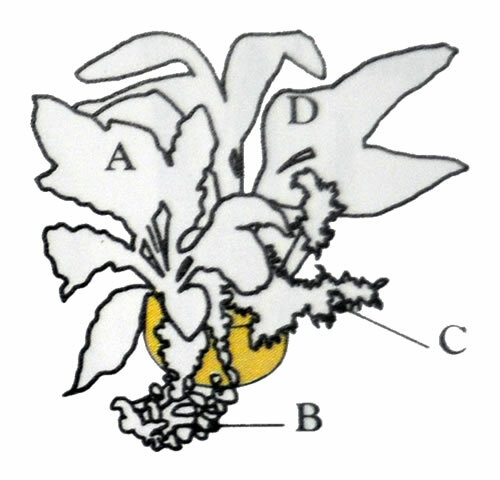 For subtle variety use different shade of green.Use the dark green of an Aspidistra (D) to complement a paler Asplenium (A). 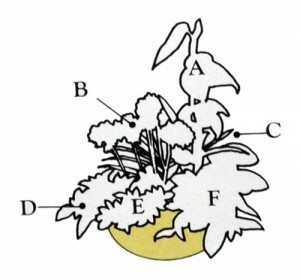 An arching Pteris fern (C) and trailing Ficus (B) add grace to the arrangement of glossy, light-reflecting leaves. When filling a hanging basket with plants, do not let it seem to be weighed down by the load. 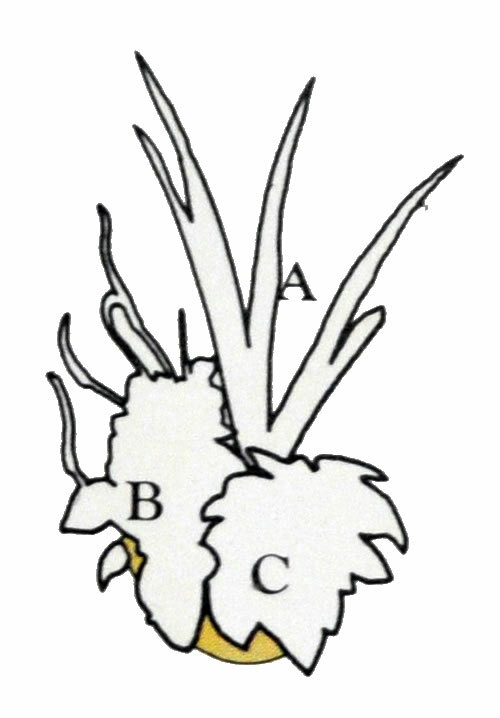 Here the feathery Asparagus (C) predominates over the broader-leaved Chlorophytum (A), Ficus (B) and Scindapsus (D). Be sure that plants in a single container require similar growing conditions. 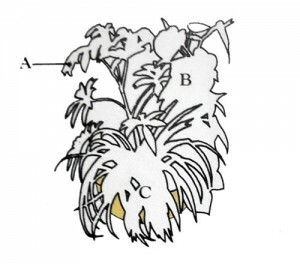 This group of plain green Nidularium (D) along with the coluorful Dieffenbachia (C), Maranta (A) and trailing Scindapsus (B) must have a moderate amount of water and be kept out of the direct sunlight. 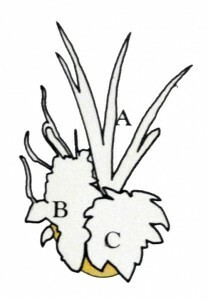 In grouping tall with low plants, balance can achieved by massing variegated leaves at the low level. Here the eye is drown from high, green Heptapleurum (A) and Philodendron (B) to low, grassy, green and white Chlorophytum (C). Suit container to the general contours of the display. This Grevillea rises squarely above a Fatshedera and Ficus, creating a rectangular grouping for which the tall, square-cornered pot is highly appropriate. Soften the impact of flamboyant foliage by adding sober-coloured leaves. 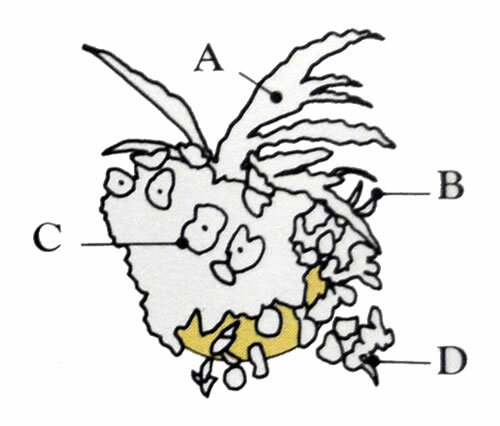 Multicoloured Codiaeum (A) is less starling encircled by trailing Ficus (B), spidery Dizygotheca (C) and purple-blotched Maranta (D). Tissue-thin Caladium leaves (A) need humid warmth to stay healthy. If such conditions can be maintained, mingle Caladium with speckled Dracaenas (B) on a bed of sprawling Pellaea (C) for a truly incomparable display. Use an extremely colourful grouping to enliven an otherwise dull area. But remember that this combination of purple Gynura, pink spotet Hypoestes, silvery Pilea and bold-figured Calathea would be over-dramatic for many positions. 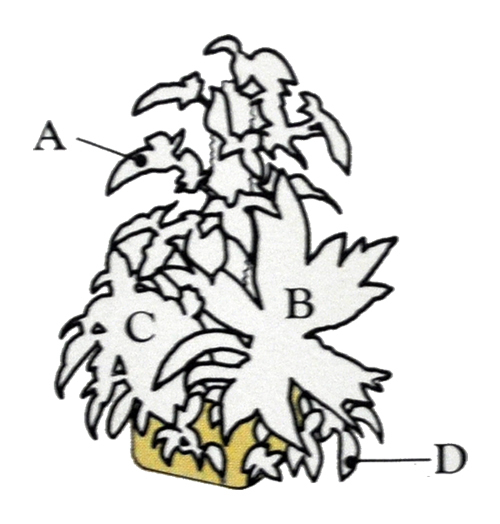 Try to brighten a sombre climbing Cissus (A) by arranging plants with similar shaped but richly coloured leaves like Begonias (B) around its base. Flowering Kalanchoe (B) forms the brilliant red middle ground of this triangular group: low growing variegated Cleyera (F), Fittonia (E) and Peperomia (D) at the base, are flanked by thin-leaved Codiaeum (C) and Philodendron (A) climbing a hidden stick. 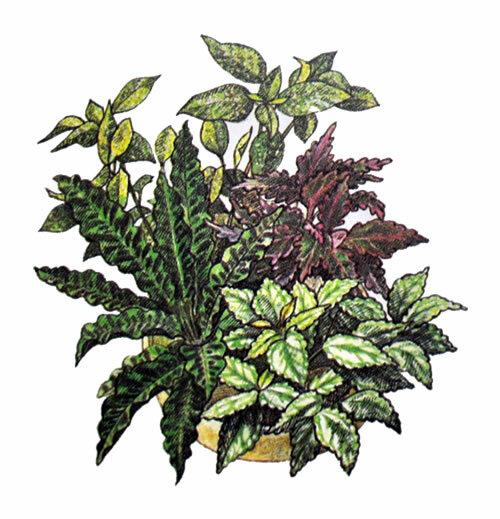 To create a table display add splashes of pink Begonia flowers (C) to a grouping of wavy Calathea (A), trailing Plectranthus (D) and Peperomia caperata (B) with its protruding linear blooms. 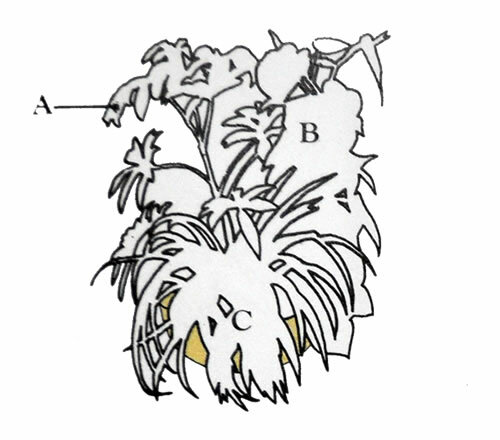 Use Syngonium (A) trained up a moss pole, leathery-leaved Aglaonema (B) and brilliant Pachystachy (C) with silken-leaved Tradescantia (D). 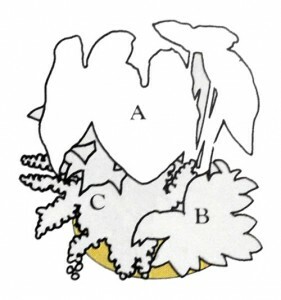 The tall, graceful Howea (A) looms over a mass of unruly, training Stenotaphrum (D) backed by green and red Fittonia (B) and golden edged Peperomia (C). 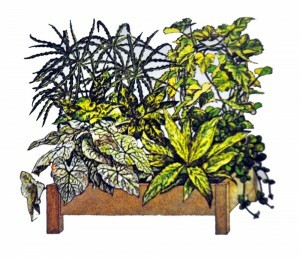 Place this arrangement in front of a mirror to add depth to this studied combination of plants. This is a well-considered, creative display for not only do the low-lying Pilea (C) and Peperomia (B) contrast with tall Sansevieria (A), but the Peperomia flowers reflect the shape of the tall, rigid leaves. 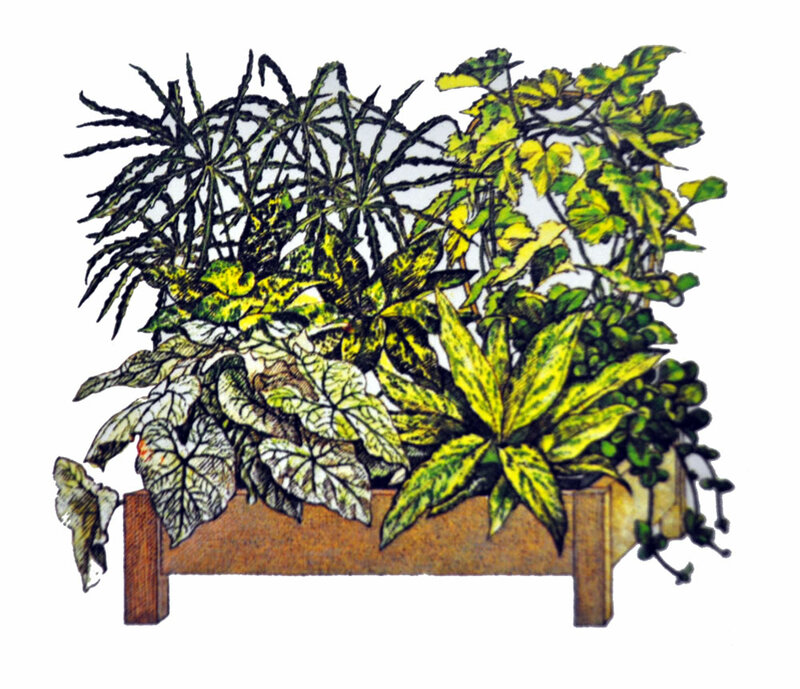 A single container holding such a varied plants as a climbing Abutilon, trailing Episcia, bushy Aglaonema, clump-forming Dieffenbachia and Caladiums and feathery Dizygotheca makes a handsome display. But because they need different amounts of water, be sure to plant each kind in a separate pot. 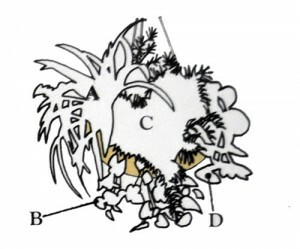 Note that some must live in the shade of others and get less light. A creeping Fittonia should be a good substitute for the Episcia when its flowering period ends.